PARTIES - Start with picking a party package. We recommend doing at least 2 activities to fill the two hour time slot. Party packages have a minimum of 10 guests. It's fun for the kids and easy for the parents! No set up, no clean up, no worries! We take care of everything. We have different packages to choose from, or the option to customize the party that is right for your family, you can't go wrong. For Laser Tag only and Ninja only parties we highly recommend choosing a 30 minute add on to fill up your 2 hour party. Nerf Minecraft: $45 for 30 minute session of our popular nerf battle game. Guests build forts out of hundreds of foam blocks. We pass out nerf guns, darts, and goggles and the battle ensues. Dodgeball: $45 for 30 minutes A great active party game with our super soft dodgeballs. 9 Square in the Air: $45 for 30 minutes of a new popular game based on the classic “four square” playground game. In this case your square is above you and you can’t let the ball bounce in your square. Guests rotate through the 9 squares trying to reach the center and become king! Gaga Pit Rental: $45 for 30 minutes or $25 for $15 minutes. If you don’t know what Gaga is, ask your kids. It’s a blast! Some attractions have age/weight/height restrictions. Also, some attractions may not be available at he time of your party. Parties of 22 or more will not be able to play Laser Tag as one group. Groups may have to be split in order to play laser tag. At the time of booking, a non-refundable $50 credit card, cash or check deposit is required to reserve your party room. 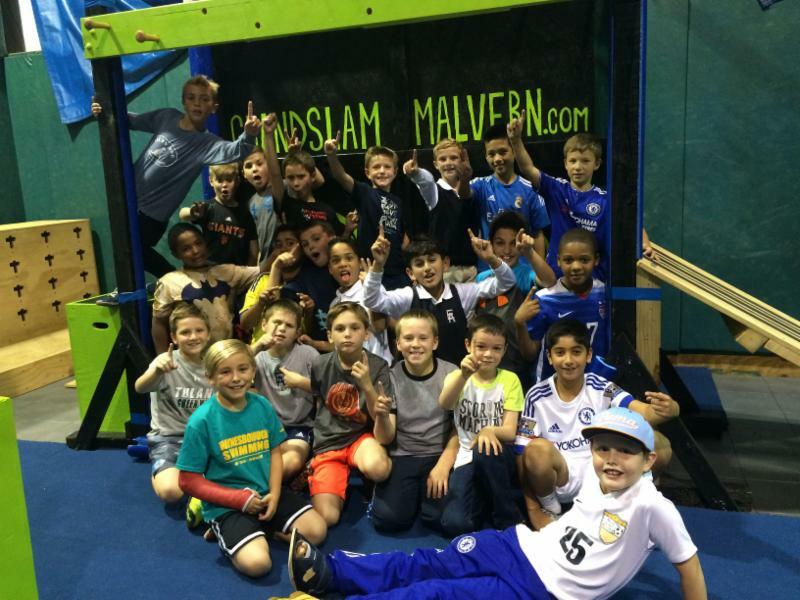 Grand Slam will call you the week prior to your party to confirm details and get final guest count. Your private party room hours are during the hours reserved. Due to scheduling, Grand Slam cannot guarantee your room will be ready until the actual start time of your party. Also, you may stay at Grand Slam as long as you'd like after the party, however we must ask that you vacate the room at the end of your specified party time. You will be able to use large plastic bins to store your belongings after your party hours.